In the present investigation, a carbide-free bainitic steel has been produced in the laboratory through the air cooling route. Optimization of the alloying elements was done based on thermodynamic and kinetic calculations. Emphasis was given to obtain ultrafine bainitic microstructure by maximizing the driving force and lowering the transformation temperature of bainite formation. In addition to bainite, the microstructure contained a small amount of austenite and martensite. It was observed that Mn decreases ΔGγ → α to a greater extent as compared to Cr and Si. Therefore, a low Mn-high Cr alloy exhibited large driving force and low Bs temperature. Si promoted carbon partitioning in the adjacent austenite to make it more stable. Therefore, the transformation of deformation-induced martensite from the retained austenite during the deformation process was restricted, resulting in higher toughness of the alloy. Thus, the air-cooled bainitic steel produced in lab scale showed better strength, toughness, and hardness than the conventional bainitic steel produced by the isothermal route. Manuscript submitted August 21, 2017. 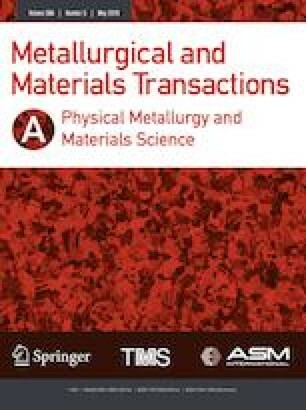 The authors are thankful to the director, CSIR–National Metallurgical Laboratory, for his kind permission to publish this work. The fruitful technical discussion with Dr. M. Ghosh, Sr. Scientist, CSIR-NML, is gratefully acknowledged.